Dry montane forests, which make up approximately 4% of the total forested acreage in our focal area, are predisposed to burn frequently and at low severity, with fires primarily traveling through the forest understory. Data from 19 fire history studies in this forest type within western Montana and northern Idaho indicate that the average stand has a mean fire return interval of 31 years (Arno 1976, 1981; Arno and Gruell 1983; Barrett 1981, 1991, 1997, 1999a, 1999b; Habeck 1992; Lehman 1995; Losensky 1993a, 1993b, 1993c, 1993d; Pierce 1995a, 1995b, 1995c; Zack and Morgan 1994). Fires occur often in dry montane forests because vegetation is regularly flammable. These low-elevation forests experience prolonged dry seasons every year (Agee 1990). Typically, the soil surface dries to the wilting point sometime between late June and July; by mid-August the wilting point depth can exceed 20 inches (Pfister et al. 1977). In other words, plants with shallow roots, including grasses, forbs, and some shrubs and young trees, are usually crispy-dry, and therefore highly flammable, by mid-summer in these forests (Peet 1988). Dry montane forests are therefore primed to burn by the time lightning activity picks up in the summer months. Both spark and drought are likely to coincide at a number of points within the span of these forests in any given year. The resulting patterns of fire occurrence are largely dictated by the amount and configuration of flammable vegetation, a.k.a. forest fuels. Once a dry montane forest burns, it takes about three years for fuels to reaccumulate to a level capable of carrying another fire (Heyerdahl 1997). Leaf litter and woody debris decompose relatively slowly in these dry forests, and therefore accumulate most readily during fire-free periods (Fischer and Bradley 1987). Live fuels were seldom a fire hazard in low-elevation dry forests prior to the successful fire exclusion efforts of the past century. 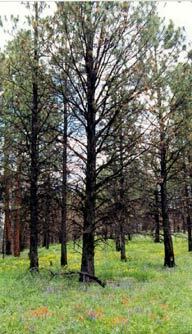 Common dry forest trees, namely ponderosa pine, regenerate only episodically, as good seed years are infrequent and soil moisture is seldom adequate for seedling establishment. In the past, regeneration was furthermore checked by fires that revisited stands before many young trees could develop thick, fire-resistant bark. These fires also pruned low branches from older, fire-tolerant trees. As a result, stands usually contained groups of widely-spaced trees, most of which with sparse low foliage. Fire carried largely through the forest understory. Only in rare thickets could it run from treetop to treetop. Before fire exclusion, such thickets were probably restricted to areas protected from spreading fire by rock outcrops, waterways, or other topographic features, and to relatively moist sites within the dry forest continuum (Arno 1980, Barret and Arno 1991, Fischer and Bradley 1987). By lighting some fires and putting others out, humans have increasingly influenced the way dry montane forests burn and look. Due to the proximity of these forests to human habitation and the relative ease with which low-intensity fires can be controlled, we have directly shaped the fire regime of this forest type to a greater extent than that of any other in the region. Indians, for example, substantially increased the fire frequency in dry montane forests of western Montana by setting fires in heavily used valleys (Barrett 1980, Barrett and Arno 1982). More recently, however, human influence has had the opposite effect (Rollins et al. 2000). Successful fire exclusion efforts of the past century have allowed many of the region's low-elevation dry forests to grow thick with regenerating trees, increasing the likelihood that a given fire will carry through the treetops and leave a slew of dead trees in its wake. More information on historical and contemporary patterns of fire occurrence in western Montana and northern Idaho, including maps and geospatial data, go to the USFS Northern Region National Fire Plan Cohesive Strategy website and click on Data and then Fire. We plan to incorporate versions of these data and images - highlighting dry montane forests - into this page in the near future. Arno, S. F. 1981. Fire history on the Fontenelle Creek aspen study site. Unpublished report on file at USDA Forest Service, Intermountain Forest and Range Experiment Station, Intermountain Fire Sciences Laboratory, Missoula, Montana, USA. Barrett, S. W. and S. F Arno. 1991. Classifying fire regimes and their topographic controls in the Selway-Bitterroot Wilderness. Pp. 299-307 in Proceedings of the 11th conference on fire and forest meteorology. Society of American Foresters, Bethesda, Maryland, USA. Habeck, J. R 1992. Dry Mountain Research Natural Area Vegetation history and fire ecology. Unpublished report on file at USDA Forest , Deerlodge National Forest, Butte, Montana. Heyerdahl, E. K. 1997. Spatial and temporal variation in historical fire regimes of the Blue Mountains, Oregon and Washington: the influence of climate. Dissertation. University of Washington, Seattle, Washington. Lehman, K. 1995. Fire history in the South Elkhorn Mountains, Montana. Thesis. University of Idaho, Moscow, Idaho, USA. Losensky, B. J. 1993c. Finnegan Ridge, Spanish Breaks. Unpublished report on file at USDA Forest Service, Region 1, Missoula, Montana, USA. Losensky, B. J. 1993d. Fire history for the Doolittle Creek drainage, Wisdom District, Beaverhead Forest. Unpublished report on file at USDA Forest Service, Region 1, Missoula, Montana, USA. Rollins, M. and T. W. Swetnam, and P. Morgan. 2000. Twentieth century fire patterns in the Gila/Aldo Leopold Wilderness Complex New Mexico and the Selway-Bitterroot Wilderness Area Idaho/Montana. Pp. 283-287 in D. N. Cole, S. F. McCool, W. T. Borrie, J. O'Loughlin, compilers, Wilderness science in a time of change conference - Volume 5: wilderness ecosystems, threats and management. USDA Forest Service Rocky Mountain Research Station, Proceedings RMRS-P-15-VOL-5. Availiable online at http://www.wilderness.net/pubs/science1999/Volume5/Rollins_5-34.pdf.